Note how the Toolchain and RemoteBuildEnvironment elements were replaced by a shorter ToolchainID element. 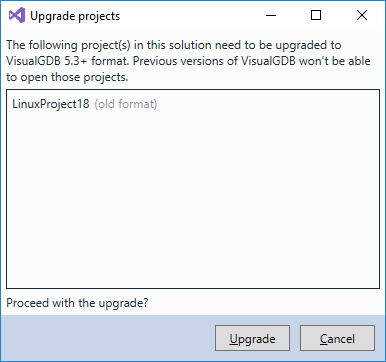 VisualGDB 5.3 will automatically locate the toolchain corresponding to the ID and version from the project file and will automatically set the paths and environment variables from it. Note the new $(ToolchainMake) and $(ToolchainMakeArgs) variables that are automatically set by VisualGDB when it locates a toolchain matching the ID. Converted projects will have both the old <Toolchain> and the new <ToolchainID> elements. You will be able to continue building the converted non-embedded projects with both VisualGDB 5.2 and VisualGDB 5.3. However changing the toolchain settings via v5.2 GUI will remove the <ToolchainID> element and change the <Toolchain> instead. Changing the toolchain via v5.3 GUI will change <ToolchainID>, but will keep <Toolchain> unchanged. If you want to build a project created with v5.3 using VisualGDB 5.2, simply add a <Toolchain> element to the .vgdbsettings file manually so that VisualGDB 5.2 can recognize it. If this is an MSBuild-based projects, also ensure you have the <Toolchain> property set in the .vcxproj file. Ensure you import if from your .vcxproj file, as pre-v5.3 VisualGDB won’t to this automatically. If you haven’t tried VisualGDB 5.3 yet, give it a try. It includes numerous improvements to building and debugging experience, supports profiling and code coverage for Linux projects and many more features. You can find the detailed changelog here: https://visualgdb.com/history/.